This pair of candlesticks, believed to be from Paraguay, was likely created for a church and used in the celebration of the Mass. One candlestick is slightly shorter than its mate as one of its elements has collapsed slightly, but they were originally the same height. For their design, the artisan has adapted an architectural motif, a twisting Solomonic column. This form was also used in church façades across Spanish America. The simple two dimensional leaf motifs on the base echo the more elaborate bas-relief foliate shapes above. They decorate cup-shaped elements that are hollow, but had a practical role, as they captured dripping wax in their flat tops. The candlesticks are made for maximum visual effect with a minimum of material. All of the pieces are hollow and were made separately, and small stylistic differences suggest that they may have been created by different artisans in a single workshop. Once finished, the disparate pieces were joined along a metal rod, which formed a supportive spine for the hollow silver. They are each about 56 cm (22 inches) high. Since colonial Paraguay was under the aegis of the Jesuits, these candlesticks may have been made for a Jesuit church. They have no assay, or metal-making marks, which is typical of pieces made outside of metropolitan centers. These candlesticks most likely once stood atop a church altar. In the 1940s, they were collected, with other objects, by employees of the U.S. company I.B.M., working in Latin America. The candlesticks were given to the Museum of New Mexico in 1961 and are now part of the collections of its Museum of International Folk Art. 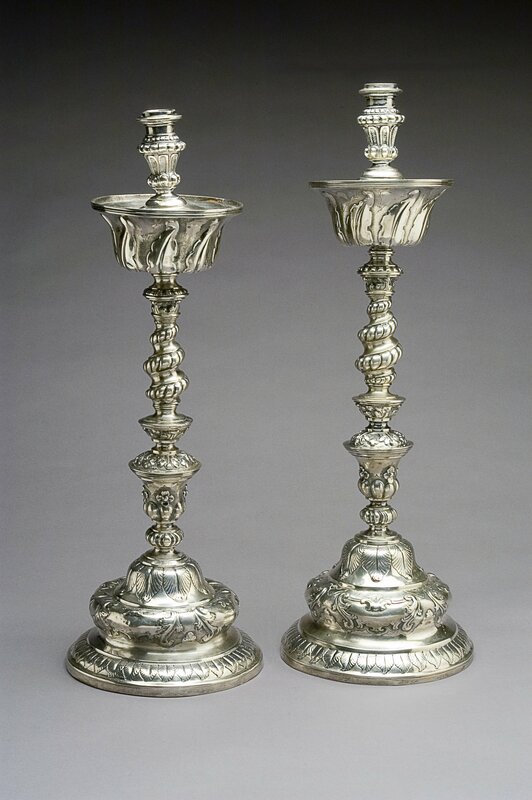 These candlesticks offer an example of “provincial” Baroque styles in Latin America. Artists and artisans in large metropolitan centers, like Lima and Cuzco, and peripheral regions, like Paraguay, developed distinct styles in response to prints, images and objects imported from Europe, or from other parts of Latin America. Reproduced courtesy of the Museum of International Folk Art, International Business Machines Collection, Santa Fe. Photo by Blair Clark. Boylan, Leona Davis. 1974. 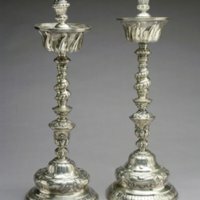 Spanish Colonial Silver. Santa Fe, New Mexico: Museum of New Mexico Press. Esteras Martín, Cristina. 1994. La platería en el Reino de Guatemala, siglos XIV-XIX. Guatemala: Fundación Albergue Hermano Pedro.